Everyday in upper elementary my students visit one reading center. Each week they visit teacher time, word work, work on writing, listening to reading, and read to self. Psst.. at the bottom of this post you can grab a video that talks about all of the centers. During word work students get to play with different word patterns, word meanings, and high frequency words. They also gain a stronger knowledge and interest in learning unique and interesting words. By playing and experimenting with different words they are able to increase their knowledge of words for reading and writing fluency. I mean, doesn’t that all sound amazing?! Word Work looks different in upper elementary! 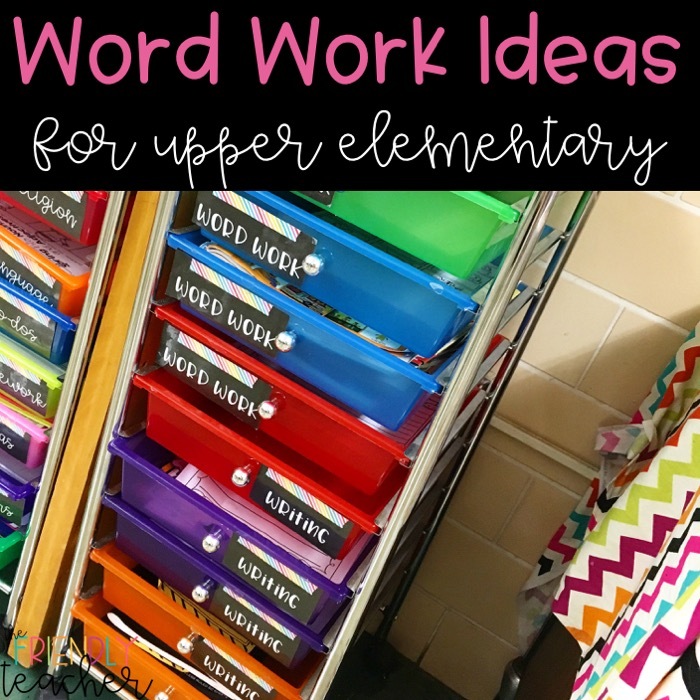 In upper elementary, I use word work to focus on vocabulary words and some higher level spelling words. Students have really mastered their phonics and high frequency skills in upper elementary. Now if they haven’t mastered their phonics (which we know some kids have not) they are working with me and other teachers often to master them. I focus on phonics in guided reading and for intervention. Why focus on vocabulary words? Vocab. is a core part of reading instruction. Learning new and difficult words help our students communicate effectively in speaking and writing, helps increase our background knowledge, and helps us to understand new ideas. In order for student to learn new and difficult word meanings they need to practice and work with them. But wait..what about learning how to spell them?! Well the great thing is when you working on vocabulary students are also learning to spell SO many different words. Many vocabulary activities have a writing component involved and they have to learn to spell the new word that they are learning. You want your kiddos to work on their center the entire time you are teaching small group, so you have to keep them engaged. Otherwise you will have someone talking, someone spitting spit balls, and someone sleeping. Am I right?! When picking vocabulary activities for my students to work on I make sure that they are engaging and exciting to students. Put a board game in the center. The students have to make cards with the vocab. word on one side and the definition on the other. In order to move the spots on the game they have to either state the definition or use the word in a sentence. Have students create books that they will put in the reading center! Tell the students that using the vocabulary words they need to create their own picture book. The picture book will then be shared with the other students in the library. Students can look up the synonyms and antonyms for the word. They LOVE using computers! Play pictionairy with a partner. They draw a picture that describes the word and the other kid has to guess. The students can get on the computer and make a presentation using their words. I don’t know about you, but my students go CRAY CRAY over some presentations! You can get paint stick samples at your local store and have the kiddos create shades of meaning using their word. Teach your kiddos about analogies and then have work with them and their vocab. words. They can create clues for their word and play guess my word with a friend. In partners they can play 20 questions with their words. 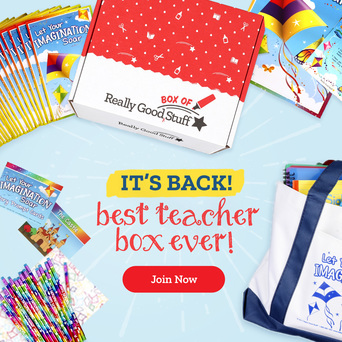 Or sign up for a freebie below! One of the keys to a word work center is organization and modeling. When you start you need to practice showing kids how to work with partners QUIETLY. You need to show them what acceptable work and what is not. You need to have kids model acceptable word work behavior and not acceptable word work behavior. After a kid models acceptable or unacceptable behavior talk about it! Then, you need to practice several times as a class and discuss what went well and what did not. 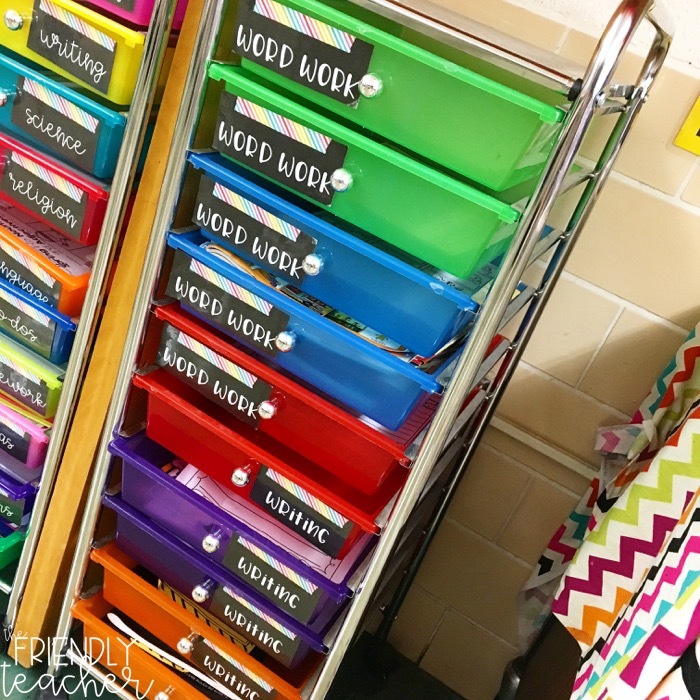 You need to have drawers, buckets, or folders show the kiddos where their choices are. 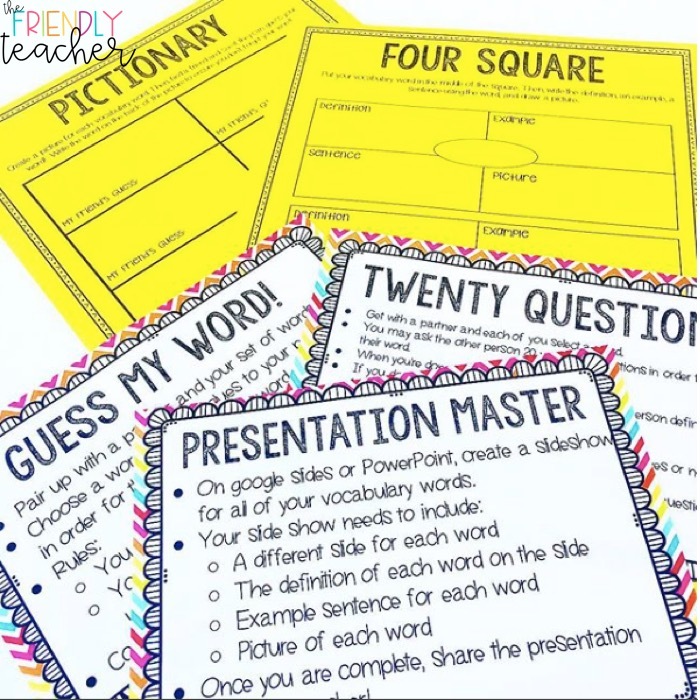 Then, when students start you need to show them that they have one minute to pick their activity, get to their spot, and get started. Do this by putting a timer on the board and having them try to beat the timer. I highly suggest explaining to students that playing these games and working through fun activities is a privilege and if they are not staying focused then they will not get to choose their activities. 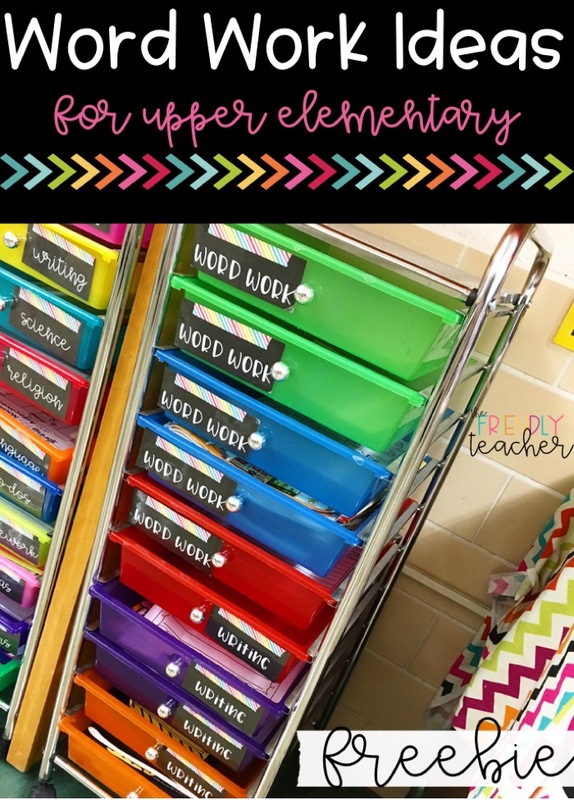 I laminate all of my activities at the beginning of the year and put them in a folder. The folder goes in a crate with all of my word work manipulative. Then, every week I go to my folder and pick out a new activity and switch it out with one of my old ones. This way I am rotating often and it only takes me a quick second to switch it out! If you want less prep work you could use all of your centers in a digital fashion. Put them on Google Classroom for the students to access. The students fill out the sheets and work with the words in the same activities. If it is a partner activity the students can share their document with a friend who will complete their part and share it back! At the beginning of the year I put all the task cards in a packet for the parents. 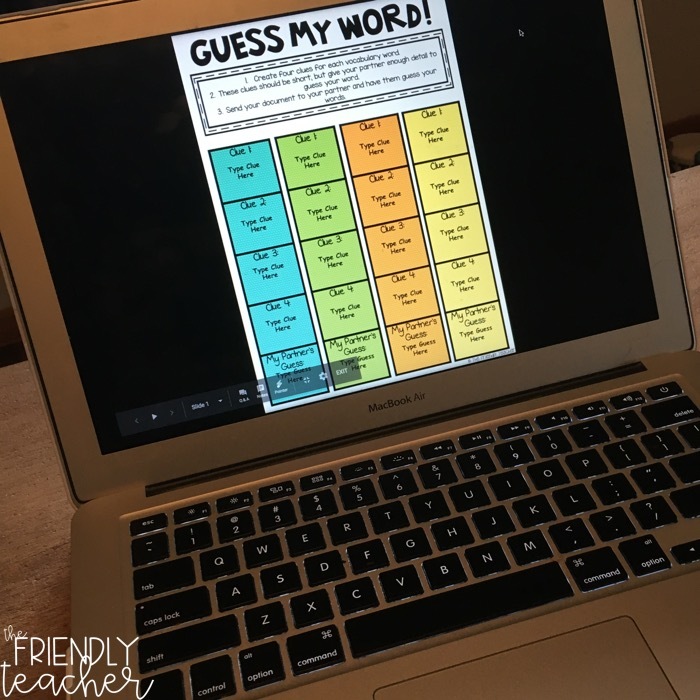 I explain to my parents that the students will have vocabulary words each week and these activities are great ways to practice at home. Parents genuinely appreciate when you give them a way to help their kids study and be engaged at the same time. Plus, you are building a good connection between home and school. Where do I get the words? You can use the words that are assigned by your curriculum at your school. You can use tier 2 and 3 vocabulary words. You can find a HUGE list for FREE here! 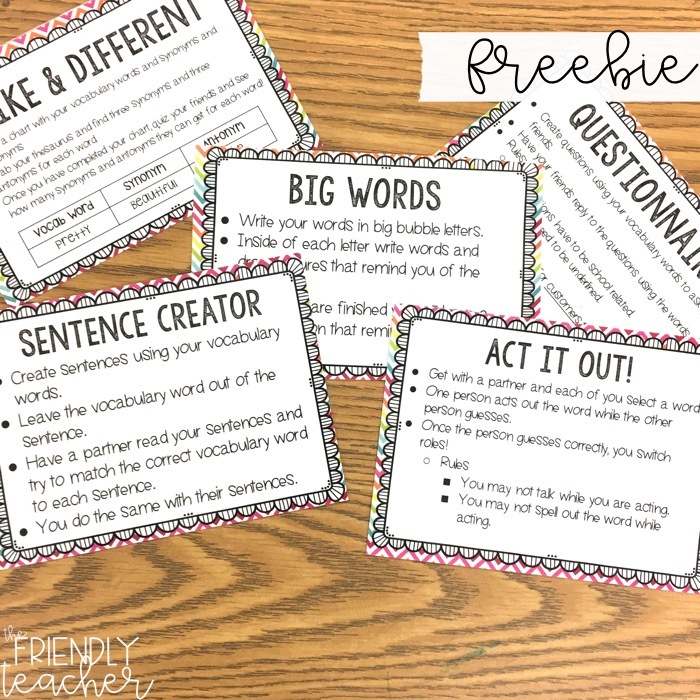 While you are working in small groups your students will be ROCKING their vocabulary words and gaining concrete understanding of many new words!